ARTBA Chief Economist Dr. Alison Premo Black at the podium during Sept. 11 release of her report on Connecticut transportation investment. With her are, left to right, Don Shubert, Lyle Wray and Amy Parmenter. 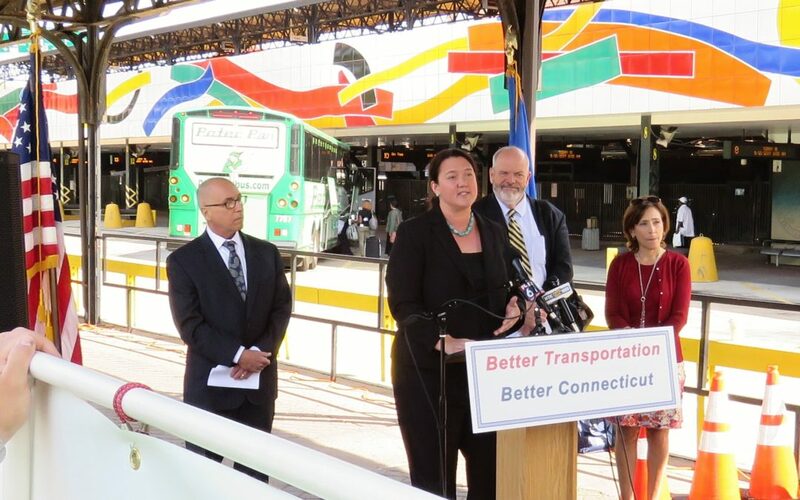 Failing to invest in transportation infrastructure over the next 20 years could cost Connecticut over $65 billion in lost benefits, wages and output from drivers and businesses, and nearly $21.4 billion in state GDP, according to a new ARTBA report. The state would lose $3.2 billion in economic activity each year, including $675 million in annual savings for Connecticut drivers, transit riders and businesses; $2 billion per year in lost sales for Connecticut businesses; and $537 million per year in unrealized wages from 10,227 unfilled jobs. “The Economic Impact of Failing to Invest in Connecticut’s Highways, Bridges, and Transit” report examines the impact of two difference funding scenarios in Connecticut. The report was released as the Connecticut House Democrats introduced a budget proposal with a $700 million annual bonding limitation. During the Sept. 11 report release event at Union Station in Hartford, Black was joined by Don Shubert, president of the Connecticut Construction Industries Association; Amy Parmenter, public affairs manager of AAA Allied Group; and Lyle Wray, executive director of the Capitol Region Council of Governments. Major sectors of the Connecticut economy continue to struggle. Real GDP was down 41 percent in the manufacturing sector in 2016 compared to 2007, 24 percent in finance and insurance and 17 percent in the construction industry. The transportation challenges facing the state are significant, and will only continue to grow.